COME, LISTEN, LEARN, DISCUSS, AND ESPECIALLY SING SPIRITUALS IN A CHURCH! Do you want to learn more about Balm in Gilead; Go Tell It On the Mountain; Kum ba yah; Oh Freedom; Swing, Low, Sweet Chariot; Wade in the Water, and other spirituals? Spirituals are the religious folksongs of Black American slaves that began to appear early in the nineteenth century. 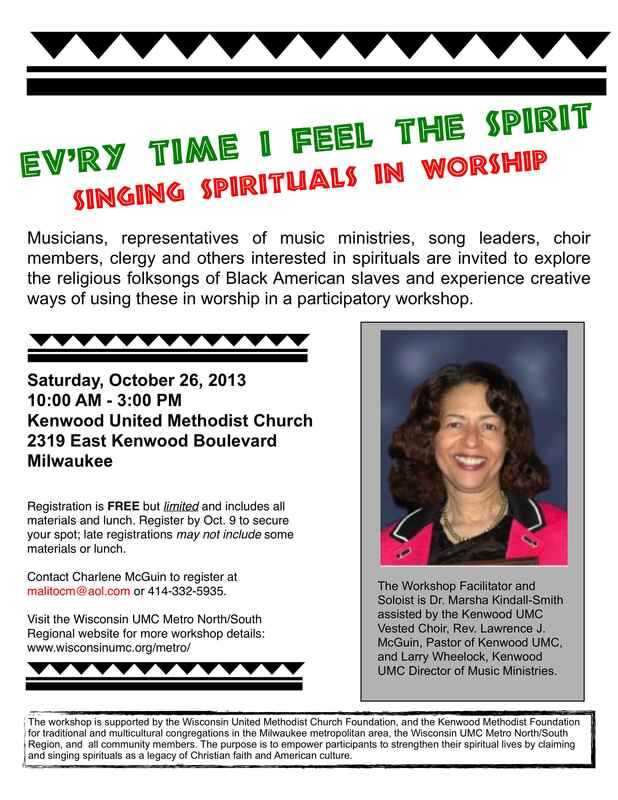 at Kenwood United Methodist Church, 2319 East Kenwood Boulevard, Milwaukee, Wisconsin 53211. The Workshop Facilitator and Soloist is: Dr. Marsha Kindall-Smith. This participatory workshop includes a demonstration performance by the Kenwood UMC Vested Choir, classic audio CDs by choirs and soloists, and DVDs. Workshop assistants are Rev. Lawrence J. McGuin, Pastor of Kenwood UMC; and Larry Wheelock, Kenwood UMC Director of Music Ministries. The workshop, which receives support from the Wisconsin United Methodist Church Foundation, and the Kenwood Methodist Foundation, is for traditional and multicultural congregations in the Milwaukee metropolitan area, the Wisconsin UMC Metro North/South Region, and community members. We want to empower participants to strengthen their spiritual lives by singing spirituals. As you learn more about the articulate messages of slaves, we hope that you will claim and sing spirituals as a legacy of Christian faith and American culture. October 9th is the registration deadline. Contact Charlene McGuin to register at malitocm@aol.com or 414-332-5935. Workshop sessions and lunch are free, but limited. Register early! Visit the Wisconsin UMC Metro North/South Regional for more workshop details at www.wisconsinumc.org/metro/.